From the Pastor’s Mat~ Yoga on a stick? In Minnesota, there is one sure way to confirm suspicion that a shift is about to happen, when we see EVERYTHING ON A STICK at the Minnesota State Fair ads! As a child the State Fair was a reprieve from school shopping and restored early bedtimes in preparation for the new school year schedule. As a young adult it was all about the food, rides and the beer garden! As an older adult it was about people watching, best deals on food and memories. Some people hate the crowds at the fair and then there are those of us who love the community aspect of the Great Minnesota Get Together. One might think that the setting of the State Fair is a highly unlikely place for one to practice yoga but on the contrary, it is the perfect place to see if you can sit with your breath, incorporate gentle movement in your resting and regain your center before moving back into the crowd. Yoga was meant to be lived off the mat in just such places, it is the lesson of the breath. Jesus has also called us to all kinds of community where we would meet all kinds of people different than people we meet everyday. The state fair is a great place to practice grace as well as the yama’s and the niyama’s of right living. I do think we might want to be selective about where we take our deep breath, there may be scents at the fair that could be more of a distraction, more challenging, than we are use to, think mini donuts or the animal barn. But there are also spaces that we can carve out and make sacred by claiming a spot, closing our eyes and breathing slow relaxed breaths. 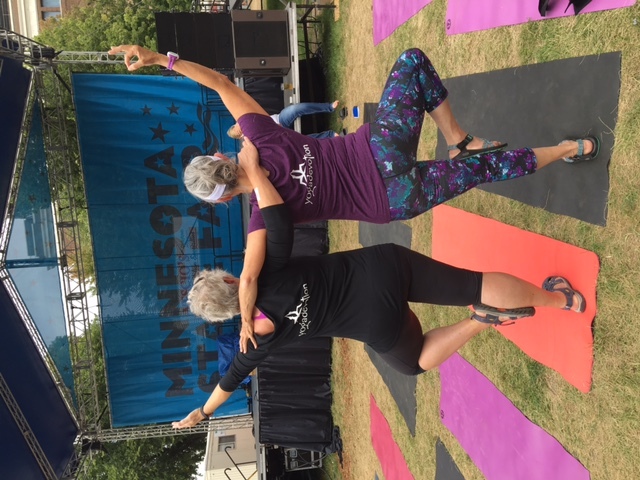 Again this year Yogadevotion will be part of the Yoga and Wellness Day at the State Fair. We will be in Dan Patch Park Sunday Sept.3 from 8 am-6 pm. We will be giving away prizes, free classes and we will help you catch your breath! I will be teaching a Free chair yoga class from 1-1:45 pm. Please join me if you are at the fair, chair yoga is so available to everyBODY. You will also meet many of the Yogadevotion instructors, be able to sample activities from the larger yoga community and you may be inspired to wellness by joining a class. Most Yogadevotion classes begin next week, a full listing of a class near you can be found at www.yogadevotion.com. For now, smooth into the transitions with gratitude and joyful anticipation for what lies ahead. Above all remember to breathe, breath is one of God’s greatest gifts.